When I saw that Boots had the whole of the Simple skincare range at half price last week I thought it would just be plain RUDE not to invest in a few bits for myself. I love Simple and have been using it on and off since I was probably about 14- alongside Nivea they have got to be my favourite drugstore skincare brand. Being on a bit of a budget for the next year ( you can read about about that here) I will be splashing out less on more expensive high end products/brands and sticking to barry bargains which I know work well! I picked up 7 products from the range and wanted to tell you all about them as I have been so excited about how cheap they are right now! L2R : Facial Wash, Facial Toner, Facial Scrub, Light Moisturiser, Illuminating Cream, BB Cream & Handwash. This is a product I've used before, but not for a long while! I have to have a facial wash in the shower for every morning, something to wake both me and my skin up and prep my skin ready for my morning skincare routine and make-up! This is always my back-up when I run out of my Liz Earle Skin Tonic. This is something I use every morning and every night - I feel grotty without a toner! I'm a scrub addict. Especially during the summer months when I feel I can notice build up so much more! For the price this is a total bargain - great to keep in the shower and use 1 or 2 times a week! I have wanted to try this for so long, but my stingy self has refused to pay out the missley £6.59 for it haha! My Mum bought this months and months ago and said how much she liked it and I'm really glad I have finally bought it as it is lovely! Again... I've wanted to try this since the day it came out! BB/CC creams are a favourite of mine for this time of year and I'm looking forward to using something a little lighter than my usual high coverage foundation. The only thing that worries me is that from what I saw there is only one shade... I haven't tried it yet so I'm hoping it will be okay! Last but not least something for the kitchen/bathroom (which ever one runs out first!) I wash my hands alot so having something which is kind to skin is really good for me and for half the price I thought it would be a nice treat! 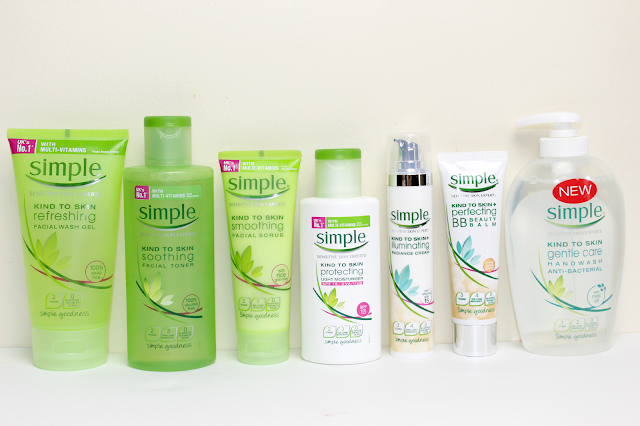 Do you use anything from Simple? What are your favourite products? 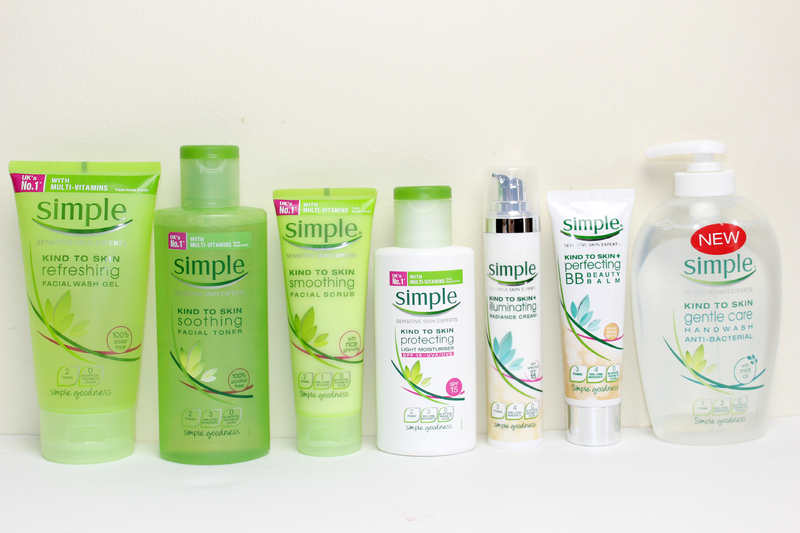 I have only tried Simples micellar water and Pore minimising toner. I would love to try out the light moisturiser but is it moisturising enough for dehydrated skin? I haven't tried out this range -- they're a little expensive in Australia, but I've heard that sometimes they're not so nice on sensitive skin! I might give the moisturiser a go one day though, because I loooove moisturisers! I'm always looking for new skincare products, but I'm also about to run out of Toner (I'm trying to run down all my skincare products before I move so I don't have to take loads of ends of products with me) so I might have to check Simple's out. I really like their Eye Makeup Remover if you haven't tried that yet. I have pretty sensitive eyes and this doesn't irritate them at all. These are all such good prices, I love getting things when they're on special offer it just makes the products seem even better hehe :) I always seem to forget about simple skincare so I'm going to have to take advantage of this offer! Ohh such a steal! I do love Simple, they cant seem to go wrong! I loveeee Simple! Will always be a brand I go back to. Might have to go get some if they're half price! I LOVE the cleansing lotion. It's great for dry skinned gals as it's not drying in the slightest. As it's so cheap I'm not worried about how much I use. I massage a big whollop (technical term there!) and rinse off. If I haven't already removed my makeup using micellar water I'll do the whole thing again just to make sure my skin's completely clean. Brilliant stuff!